Visiting Angels Newton/Canton has been named one of the Top Places to Work in Massachusetts in the 11th annual employee-based survey project from The Boston Globe. 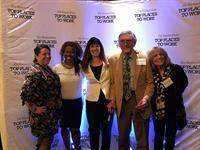 The Top Places to Work 2018 issue.Top Places to Work recognizes the most admired workplaces in the state voted on by the people who know them the best—their employees. The survey measures employee opinions about their company’s direction, execution, connection, management, work, pay and benefits, and engagement. The employers are placed into one of four groups: small, with 50 to 99 employees; medium, with 100 to 249 workers; large, with 250 to 999; and largest, with 1,000 or more. Visiting Angels Newton/Canton has made the Top Places to Work list four out of five years. Visiting Angels Newton/Canton was ranked 14 in the Medium Employers category.The rankings in the Top Places to Work are based on confidential survey information collected by Energage (formerly WorkplaceDynamics), an independent company specializing in employee engagement and retention, from nearly 82,151 individuals at 318 Massachusetts organizations. The winners share a few key traits, including offering progressive benefits, giving their employees a voice, and encouraging them to have some fun while they’re at it.